Well, spices are produced from bark, root, buds, seeds, berry or fruit of tropical plants and trees. So, at the surface, to me it sounds like coffee beans could definitely fall be described as a spice. My initial googling resulted in finding out that there are mixed reviews on this subject. Anyway, I read that there are quite a few spices that complement coffee. It was not a surprise to find out that cinnamon, cardamom, nutmeg and ginger all complement coffee. I was surprised, however, to learn that cumin pairs well with coffee (especially since cumin is categorized as being pungent). Evidently, cumin adds an earthy undertone to cold coffee drinks (especially when served cold with milk). Here is my recipe for a really good coffee based martini. Enjoy! Combine all ingredients in a cocktail shaker… shake well. Gypsy Sweet Spice Blend consists of cinnamon and some other select spices. If you want, you can substitute just cinnamon. To get fancy, mix Gypsy Sweet Spice Blend with Splenda and coat the rim of your martini glass. 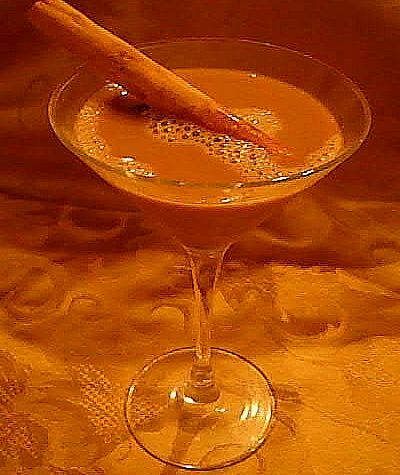 If martini’s are too strong a beverage for you, increase the amount of coffee noted in the recipe to 8 ozs and serve in a tall glass.